Maybe I have a skewed view of tv watching as a college student surrounded by a college/campus bubble, but the list of these shows shocked me. Who would have thought more people would want to advertise during “Two and a Half Men” over “Grey’s Anatomy”? Agreed, I don’t personally know anyone who watches “Two and a Half Men” besides my grandpa so I am shocked that it comes in second place. The gap between first and second place is also surprising too. But I am not surprised that American Idol came in first. It is a competition show ranging in all ages, sexes, races, and so on, that apply to all types of audiences. Plus, American Idol fans are die-hard and the fact that it is broadcast “live” makes viewers feel like they have to watch it at the EXACT time so they are always tuned in. I would have to agree with the above comment, I found that this listing for biggest money makers in TV were really mind blowing. I would have to say the only reasoning that I could think of for these listings are that shows such as American Idol have a huge fan loyalty base. Although leaving one to question why Dancing with the Stars is on there as I did not even know people watched that. Overall I found these information to be very interesting and unique. I would be very interested to see the ratings for 2011-2012. I thought it was crazy how much american idol dominated all the other tv shows. I don’t know very many people who watch american idol. I would think that 2 and half men would be highest. I wonder why American idol is highest? The thought provoking part of this is the massive jump that happens between Two and a Half Men and American Idol. 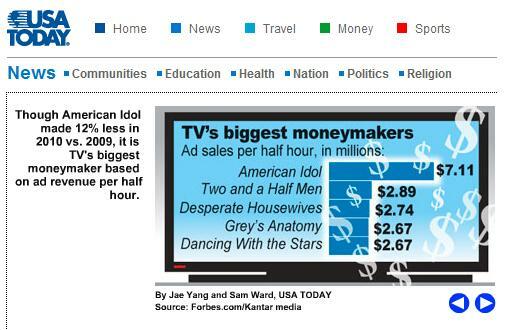 What is it about American Idol that they make 4 million more than the show listed second? I’d be curious to read an explanation of this info-graphic that gives more details on why the figures are so drastically different. Also, I would guess we’re all in the same college bubble where there isn’t a lot of t.v. watching going on and if there is it’s usually programs geared for younger audiences. This would explain why we don’t know people who are regular viewers of these some of shows. Personally, I’m not surprised by the fact American Idol has such a lead over the other shows. I’m not a viewer but I have numerous friends who have watched full seasons with their whole families. The show just has a age-wide appeal that givers advertisers a huge amount of exposure compared to the much more limited appeal of a show like Desperate Housewives or Grey’s Anatomy. It’s real life drama with real people trying to make it big: the American dream. The viewers’ opinions grow as each season develops and it’s their participationa and opinion that determines the outcome. This cultural remix of music just seems to offer it all, and apparently does more than other shows on TV. I tried to find same kind of data in case of Japan and compare to the data of American TV, but I couldn’t find it. Anyway, I don’t think even the most popular TV program in Japan is earning as much as “American Idol” in terms of ad sales, because a problem is getting more serious recently, which is the amount of revenue from TV ads is decreasing. How about America? Is it also decreasing because of online ads? My first impression of the infographic was in regards to the amounts of money paid for advertising space, when there is no way to be certain about the level of attention that the advertisers are getting from the show’s viewers. Although this may not be a large amount of money for some multi-million dollar corporations, I wonder what information leads these companies to find this medium to be a good investment for their product? I am not personally a fan of American Idol but I am not surprised that it remains one of tv’s biggest money makers, it has a cult like following. included in this cult like following is such a wide array of people; from grandmas to children in grade school. why not pay more to advertise to everyone. i was shocked that two and a half men was second, i had no idea so many people watched that show, especially in it’s network time slot. It’s not surprise that American Idol is at the top, but it’s a huge surprise that the gap is so large. $5 million per half hour more than the rest? This infographic gives a little insight into how shows are able to operate. I never knew they made that much per 30 minutes. I have not watched American Idol since the first season but I am not shocked that it is on top. I also agree with michelle because I have never watched Two and half men so i thought it was interesting for it to be on top also. I wonder if they are counting how much coke pays with because the last time I watched the show they made ads for them. Then they should them during the show. I think they do that with Ford now. I wish I liked more of these shows because they probably have bigger budgets and hopefully better then some of the random stuff at other times. Also fox doesn’t really have that man hit shows, I wonder if some of that money goes into other shows. But they have glee now so maybe one more hit show. Also I wonder how long it takes for companies to pull the comericals after the shows viewership goes down. Desperate Housewives can’t have that good of ratings. I am absolutely shocked that two and a half men is the number two spot, but i guess that is what people are watching. It is also amazing to see how much american idol has grown that the advertising for that slot is so expensive. The show keeps growing and every season it seems to become more and more popular. It is not surprising that American Idol is on top. Not just in terms of the wider audience but the type of show as well. American Idol is a reality show while the others are dramas or sitcoms. I find it easier to advertise and in turn find and fit more advertisements in your programming when you are dealing with a reality show. Not only can you incorporate ads as commercials but major sponsors will bring in quite a lot of revenue because you can advertise on the show. Whether it is the Coke cups the judges have or something else, viewers find the product placement less annoying on shows like American Idol then they would for any other the other shows listed. I was also kind of surprised by the list of shows, and the fact that American Idol has such a huge lead. I bet that this is why there are so many similar talent related shows popping up each year. I’d also be interested to see how big of a hit Two and a Half Men has taken after all the Charlie Sheen stuff. I’ve also kind of been curious how high of ratings and revenues that reruns get.